This weekend we are throwing my sister a baby shower and I am super excited. My sisters and I have been pinning away madly with ideas for the party and it's all coming together beautifully. I can't wait to get the place set and see all the lovely things that she gets. One of the biggest questions I've been asked in the lead-up to the party is what to get for the new Mum and baby. Knowing what to buy for an expectant Mum can be hard sometimes, especially if you're not sure what they already have, or if you've not had much experience with babies and newborns. Luckily for you, I have had extensive experience with babies and baby showers and I've learnt a few handy things about buying good baby shower gifts along the way. 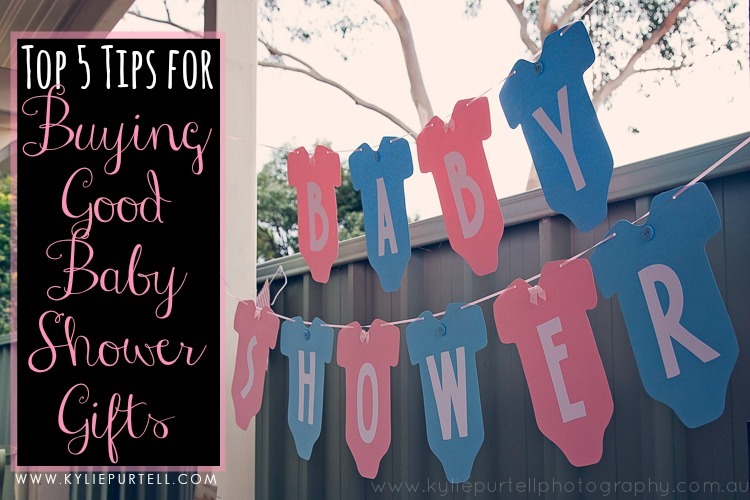 So I thought today I would share with you my top 5 tips for what to give at a baby shower. Most expectant parents already have the big stuff covered. The big stuff being things like cots, prams, car seats and baby monitors. Not only are these quite expensive, but most people like to do their research and get a specific brand or type. The same goes for furniture and large decorative items for a baby's room. Most Mum's have a personal decorating style, so unless you know what that is, or have spoken to the Mum in question and know exactly what she wants or the colour scheme/style then it's best to steer clear altogether or get things that will fit with any scheme or style. When I say practical, I really mean practical. Think newborn nappies. Baby wipes (it's quite astounding how many a newborn can burn through, and they are also great for cleaning other messes as well). Nappy sacks (the little plastic bags used to tie up and throw away dirty nappies while out & about). Nappy rash cream. Gentle, soap-free baby wash (and not that nasty Johnsons stuff you hear, it's not fit for adults let alone sensitive newborn skin!). Practical stuff always comes in handy, especially a big pack of old-school cloth nappies. Those old-school cloth nappies are the perfect thing for cleaning up baby spew and I lived with one over my shoulder permanately for the first 6 months of each of my girls lives. If you the Mum-to-be is lucky enough to get a spewer like I was, having plenty on hand is a god-send. I'm a big fan of giving something a little special along with the practical gifts, so hitting up an online store such as the Baby Vegas Website is a great idea. Baby Vegas have heaps of awesome things for kids, from fun, to the practical to the gorgeous keepsake. 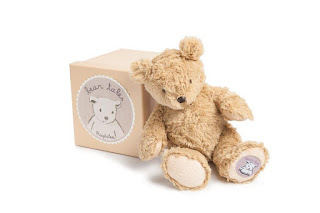 I've gotten the most divine Teddy Bear in a beautiful gift box for my sister, which I hope will not only be something special for bubs, but something that they will hang on to for years to come. I still have the Teddy Bear I was given at birth and it's a treasured piece of my history I will keep forever. After hearing about Baby Vegas I was so impressed when I checked out their website and saw the extensive range of toys, gifts, clothing, nifty storage solutions, sleep aids and so much more. Now that I've found them I will definitely be heading there as my first port of call when looking for gifts for my girls and the other special children in my life. If you'd like to try out Baby Vegas for yourself, the lovely people over there have offered up $20 credit for me to giveaway to one of you lovely readers! The details of the giveaway are at the bottom of this post. Any new Mum can tell you that 6 days out of 7, the last thing they feel like having to do in those early, sleepless weeks is have to think about what to make for dinner. By giving a gift card to a service that delivers yummy, ready-made meals, you're not only giving the gift of nourishing food, but you're also giving the new parents the gift of time and one less thing to worry about. Because nobody wants to go grocery shopping with a newborn, and even the most keen cooks could certainly do with not having to worry about preparing meals for a bit. I can say enough how good it is to receive a voucher for some pampering, whether it be pre-baby or post. Give the Mum-to-be something the gift of an hour or two off, and why not throw in an hour of your own time to baby-sit bub. It doesn't even have to be for some fancy spa or anything, even just the chance to sit and have a quick pedicure while drinking a coffee in silence is all it takes to help a new Mum recharge her batteries after the ordeal of giving birth and surviving the early weeks. Don't forget Dad, and throw in a nice bottle of grog or plonk for him to wet the baby's head with. Maybe they are a golf or footy fan, you could offer to spend the afternoon with the new Mum while Dad heads to the golf course or a game, because we all know the best Dad's need a little break now and then in the early days too. If you're keen to buy bubs some new threads, consider buying one or two items in a size bigger than newborn. Think 00 and 0. Kids grow at an astonishing rate, and I know I appreciated the larger size pieces that I was given before Punky was born, which meant that I didn't have to dash up the shops for something that actually fit her when she seemed to double in size overnight! What was the best thing you were given at your baby shower? What's your go-to, never fail gift to give a new Mum? Disclosure: Baby Vegas were kind enough to let me choose a gorgeous gift for my sister in thanks for checking out their site and having a look around. I was seriously impressed with the site and would not have included them in this post if I wasn't, and didn't think you'd like them too. I was not paid any money for this post. The competition to win $20 credit at BabyVegas.com.au is open to Australian residents only, aged 18 years and over. Competition opens midnight June 2nd 2015 AEST, and closes midnight, Friday 12th June AEST. This is a game of skill. Winner will be chosen based on their answer to the question in the rafflecopter widget. Winner will be required to create an account at Baby Vegas and the $20 credit will be applied to their account to spend as they wish in the online store. This competition is in no way associated or endorsed by Facebook.com or Twitter.com. Linking up with Essentially Jess, With Some Grace and Maxabella. My go to baby shower gift from the BabyVegas Site is a 3 Sprouts Stroller Organiser. Perfect to hold a bottle, and your phone and all the bits and pieces you need when out and about. Good advice! Small is good! Good reminder about something for mum AND dad - I think dads are often left out of the baby shower picture! One of my closest friends had a baby shower recently. I couldn't make it but she had a gift registry done up for some baby warehouse place in Brisbane. It's her first child and as she's 45 most of her friends have given her a stack of hand-me-downs etc so she's got a lot of stuff and was a bit fussy about what she wanted. I seriously have NO idea what I'm going to buy when the baby's born. I think a small group of us will buy something for her (like a beauty treatment or something) rather than something for the baby. I normally always give the 1.2m x 1.2m muslin wraps because I know they'll be useful until the baby doesn't need to be wrapped anymore. Bub still uses hers as her "blankies" now at nearly 2. From the baby vegas site I'd probably give wooden blocks because they're classic and there's so many ways kids can play with them. So these days I'm all about pampering the mum, especially if it's her 2nd or third, they seem to miss out! We used to love going to Pugh's lagoon when we lived in Hawkesbury, to feed the ducks. You take such gorgeous photos. Your girls are just adorable. Fantastic photos of beautiful moments. I would opt for pampering the mum too. I didn't have a baby shower for any of my girls. I was always moving and too far away from family and friends. I will try and remember to pop back and grab your link to add to the Aussie Giveaway linkup when I open it on Sunday. Some great suggestions here. As a mum of two I think that you can't go wrong with nappies or a pregnancy massage for Mummy. A proper pregnancy masage where Mummy can lie on her front with a special hole for her belly is the BOMB! And she won't be getting much pampering in the near future. Awesome tips. I would probably give one of the sight and sound projectors. Something that I wouldn't necessarily thing buy for my child but would certainly have loved to have tried one out, they look super cool. I'd give the "iS Gift Galaxy Star Projector & Sound Machine", it would be great to settle baby and mum could even use it to meditate! The Djeco night Light Snowglobe - Fishes, a lovely keepsake, and perfect to help bub, toddler and older to go to sleep at night. I love the Childrens Wooden Rainbow Stacking Rings Educational Puzzle, something for baby to grow with and wooden toys never go out of fashion! One of the best gifts I received was a thermometer! Perfect for a paranoid mumma after bub's first set of needles. I never would have thought about getting one myself!